In honor of National Dental Health Month, I’m going to let you in on some things you probably don’t know about me. 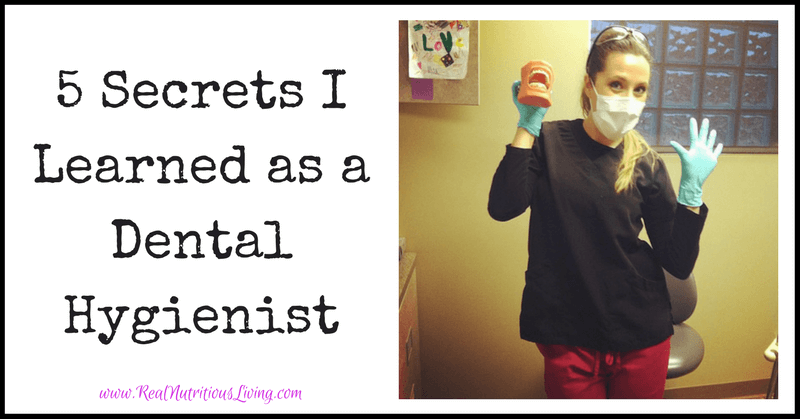 I was a dental hygienist in my former life…ok, well maybe in this life, but it feels like ages ago. Confession time: I still keep my licenses and the geek in me thoroughly enjoys a day in the clinic from time-to-time. That said, I’ve got some sneaky secrets to share. 1.You have to have dental insurance to have a healthy smile. That couldn’t be further from the truth! As a dental hygienist, the healthiest mouths I’ve seen were the folks who did their homework (aka brushing and flossing diligently) but only came in once a year. Yeah, once a year that’s what I said. These hard working patients saved the monthly insurance premium, did what they were supposed to home, and paid out of pocket for their visit. They saved both time and cash. 2. Professional whitening is the key to a bright white smile. Nope, try diluting some hydrogen peroxide twice a week. 1/2 water, 1/2 peroxide and brushing with it. Done! PS, when we have to remove some serious stain in the office, that’s what your dental hygienists are using! 3. The key to strong cavity free teeth is lots and lots (and lots) of fluoride. Friends, this is a sad and downright dangerous money making lie! That’s right, fluoride is a big money maker for dentists because it’s often not covered by insurance and it’s cheap. Fluoride is linked to kidney disease, cognitive damage, thyroid dysfunction, bone cancer and the list goes on! By all means, refuse the fluoride treatment. It’s what’s best for your health and your wallet. I’m not trying to harp, but please also switch to a fluoride free toothpaste as well. Check for the safest brands here. Agree or disagree, check out these studies on fluoride! 4. Mouthwash is the best way to kill germs and prevent bad breath and periodontal disease. DIY tip #2, warm salt water is the bomb for your mouth. 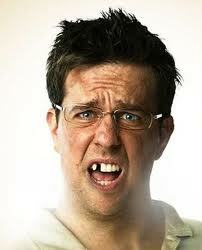 Germs, especially the dangerous gum disease causing ones really cannot live in a saline environment. (Hint: that’s why it works so well on a sore throat!) Alcohol and other additives in mouthwash are linked to throat cancer (1.) among other issues. If you have a sore in your mouth, are prone to periodontal disease or just need to freshen your breath, rinse with warm water and a tsp of high-quality salt. 5. The doctor (aka dentist) knows best. Actually, this may surprise you, but that 30-second peak the doc takes around your mouth isn’t how your dentist gained the knowledge of that cavity on your back tooth. It’s because of your dental hygienist who just spent an hour in your stinky mouth (I mean let’s show em some love- it’s a tough job.) She pointed it out to the dentist when she went to get him from his office, but the law says she can’t tell you. She’s often the true guru and reason a problem could go unnoticed if it weren’t for her detail oriented diligence. Anyone else having a difficult time escaping the face of Stu as you read this? Don’t forget to pin this for the easy DIY tips and tweet it out now! 2. Agency for Toxic Substances and Disease Registry (ATSDR) (1993). Toxicological Profile for Fluorides, Hydrogen Fluoride, and Fluorine (F). U.S. Department of Health & Human Services, Public Health Service. ATSDR/TP-91/17. 5. Awadia AK, et al. (2002). Caries experience and caries predictors – a study of Tanzanian children consuming drinking water with different fluoride concentrations. Clinical Oral Investigations. (2002) 6:98-103. 6.Bachinskii PP, et al. (1985) Action of the body fluorine of healthy persons and thyroidopathy patients on the function of hypophyseal-thyroid the system. Probl Endokrinol (Mosk) 31: 25-9. 7.Barbier O. (2010) Molecular mechanisms of fluoride toxicity. Chemico-Biological Interactions. 188: 319–333. 8.Barnes GP, et al. (1992). Ethnicity, location, age, and fluoridation factors in baby bottle tooth decay and caries prevalence of Head Start children. Public Health Reports. 107: 167-73. 9.Beltrán-Aguilar ED et al. (2010). Prevalence and severity of dental fluorosis in the United States, 1999-2004. NCHS DataBrief No. 53. U.S. DHHS, CDC, National Center for Health Statistics. 10.Beltrán-Aguilar ED et al. (2005). Surveillance for dental caries, dental sealants, tooth retention, endentulism, and enamel fluorosis—United States, 1988- 1994 and 1999-2002. CDC, MMWR, Surveillance Summaries, August 26, vol. 54, No SS-3, pp. 1-44. See Table 23. 11.Bentley EM, et al. (1999). Fluoride ingestion from toothpaste by young children. British Dental Journal. 186: 460-2. Please share what type of hydrogen peroxide to use. The cheap kind sold everywhere or the food grade? Yup Debra, regular old peroxide is fine but be sure and dilute 1/2 water, 1/2 peroxide. I hope this helps! Hi! I came across your tips and love them! I had been using a flouride free tooth paste but switched back over to a paste with flouride because i am horrifyed of any possible thing that could could go wrong with the health of my teeth. 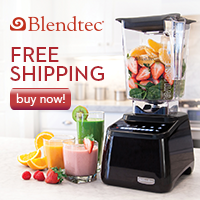 Oh sheesh, well now after reading this i might switch back over to flouride free! Thank you for that! 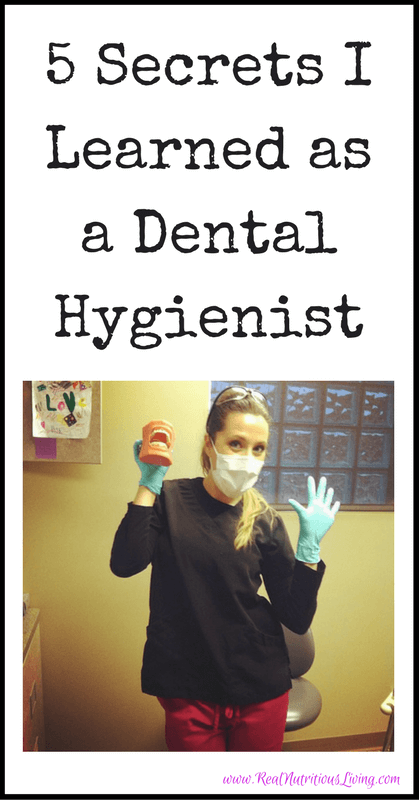 I have a question, how did you like being a dental hygenist? Would love your insight on it! I think you will be so happy if you switch back to a fluoride free paste. Plaque removal is done with your brush, floss and tongue scraper. If dental caries are an issue, you can consider some colloidal silver for it’s antibacterial properties. Diet is to be considered as well. I love dental hygiene as a profession. For me, I wanted to dig into deeper health issues than I was able to in just an hour. I felt it was hard on my body as well due to the repetitive motions and way we must sit. Don’t let that scare you off though. I have friends who have no issues so it’s very individual. Another positive if you want to have kids, it’s a great profession! I hope this all helps! Thanks for the great tips. I would love for my kids to try the salt water mouth rinse. Can you please tell me how much water to put the teaspoon of salt into? I came across your blog and I have a 1 year old. Her pediatrician recommended that I give her sodium fluoride drops so help strengthen her teeth and prevent her from getting cavities so easily. I was wondering what your thoughts were on this considering the fluoride part? They recommended that I give her 0.5 mL a day. Thanks for stopping by! First of all you’re a great Mom for paying such close attention to your daughters dental health. I personally will not be using fluoride for my baby as Harvard linked it to lower IQ among other negatives. We are one of the few developed countries adding fluoride to water. Also, fluoride is almost non-existent in breast milk vs. formula. I think it more important to focus on plaque removal and avoiding processed foods and sugar than supplementing fluoride. I say trust your “mommy” instincts. You will make the right decision! 1) Does it matter how MUCH fluoride is used or any amount is not good? 2) Which brand of floss do you recommend? I tried clicking on the site you posted but it says the page is no longer available. 3) My little one has teeth, should I just brush her teeth with coconut oil? I’m looking into DIY toothpaste that is fluoride free but I’m worried that some of the natural ingredients are not good for her if she swallows it. 2) Fixing link now- sorry!! I like radius brand the best. Dr Tungs is great too! 3) Yes! You can even mix a bit of salt with the coconut oil, if you like. Plaque removal is manual so anything we add is typically a freshener and actually unnecessary. It’s incredibly disturbing that someone claiming to be a dental hygienist or “former”, would write an article like this. Identifying yourself as a professional in the field, and then making blanket statements like “refuse fluoride because it is bad for you, and will cause this list of diseases/disfunctions”, is irresponsible. Flouride treatment recommendations, or any type of treatment recommendation should be made after an individual client assessment and based on the individual needs of each unique patient. Is it unnecessary for some? Sure. Does it provide a substantial benefit for others (that far outweighs any potential risk)? Absolutely. I encourage your readers to do their own research on fluoride. Talk to your dental professional, read peer reviewed (and objective!) research on fluoride, and then make an informed decision! Thank you for stopping by. First, I have an active dental license in more than one state, so that “claim” is fact. i also work with plenty of holistic and mainstreams dental professionals regularly who steer clear of fluoride. I am always glad for my readers to do their own research and share what they learn. At this point in time, the peer reviewed research is clear on the harmful effects of fluoride, so I am standing behind what I’ve written. Interesting take. Have you researched the topic of fluoride much? I certainly did for many years (per resources in my article.) I’d love it if you’d share some new info that supports your amen! I agree! I hoped it was a joke. OOPS! I think you meant to type PEEK in the following statement… It’s under “The doctor (AKA dentist) knows best” section. Oh thank you! I loathe typos! Where are your references for you claims of what Fluoride causes? I have a hard time wrapping my head around the “lots and lots”. So much research has shown that fluoride has decreased rampet decay in children. I do love your one about the RDH telling the DDS about cavities as well as your water and salt water! Thanks for the post. Thank you for some kind words Alisha. There are over 11 references at the bottom of the article and I linked to one of my favorite research sites in the paragraph about fluoride so you can look at thousands of studies, as I realize it’s a very hot topic! I’d love for you to check them out and report back. Believe me, I used to stand firmly where you do currently on fluoride, but my mouth felt so much better when I switched to a fluoride free formula! Shame on you for saying that fluoride isn’t a good thing for your family. You went to hygiene school like I did – you know better. Shame. So many credible sources say otherwise. And I would honestly hope someone in the dental profession would bring a more intelligent conversation to the table versus shaming. I hope you will stop by with some credible sources to back up your comments next time, as this is always an open forum for conversation and learning.